Artisanal Gold Council Blog: Is Borax the Miracle Chemical that Will Replace Mercury in Artisanal Gold Mining? Can borax replace mercury in artisanal gold mining? – or is it better concentration that can replace mercury? Does Borax really have anything to do with it? Is Borax a Miracle Chemical? Those promoting borax as a replacement for mercury in small scale gold mining are overselling it and risk giving the impression that there is a miracle cure. They may be well intentioned but they are misleading the world by claiming that borax is a direct replacement for mercury. This is simply not true. The bar of gold shown here was entirely produced using borax. It was also entirely produced using mercury. How can that be if the word going around is that borax is a replacement for mercury? It is not. Borax is used in every Artisanal and Small Scale Mining gold shop in the world and has been for a hundred years. It has been used in pottery glazes for centuries for the same reason. It is a flux. Background: if a miner has 10 kilograms of sand that contains 10 grams of gold, that is 0.1% gold or 1/1000 th. So she needs to concentrate by 1000 times to end up with the gold. How can she separate the gold from the sand? She adds mercury to the 10 kilograms of sand which dissolves the gold and is then easily separated from the sand as a heavy liquid. Then she evaporates the mercury and is left with the gold plus about 10% impurities - grains of sand for example. It is at this stage that borax is used in gold shops - for melting and removing the impurities in 10 grams of gold - not for concentrating the gold in 10 kilograms of sand by 1000 times. Borax is only used to assist in removing the impurities. Everybody has always used borax (and other fluxes) to melt gold concentrates. It makes some impurities – tiny bits of other minerals – melt at a lower temperature and become thinner so that the mineral melt, a molten glass slag, and the molten gold can be separated easily. That is what fluxes do. It doesn’t matter if you have a 25% gold, 75% sand mixture or a 90% pure piece of sponge gold (the porous product of mercury amalgamation), you’re going to use borax to melt it. Borax does not replace mercury. It is not used at the same stage of the process as mercury. Mercury is applied to a big pile of sand containing a tiny bit of gold. Borax is applied to a tiny pile of gold containing a tiny bit of sand. Therefore, the so-called borax method is nothing more than a method of better concentration that then uses borax as it has always been used. So there is no “borax method”. There is simply better concentration. Just ask any gold shop owner or his grandfather about borax... Its been around for a long time. Borax is not a miracle chemical that can solve the mercury problem in Artisanal Gold Mining. For the millions of artisanal gold miners and the governments working with them to reduce mercury use, proclamations of borax miracles should be replaced by a proper explanation: If you can make a 25% gold concentrate, you don't need mercury. It is better concentration that can eliminate mercury, not borax. And better concentration usually requires a higher level of organisation. The Blacksmith Institute is promoting borax as a replacement for mercury - see http://www.blacksmithinstitute.org/newsletter/march-april-filipino-gold-miner-reveals-borax-secret-pakistan-s-pollution-problem.html#topic1 and http://www.youtube.com/watch?v=X6Sawj0HyF0&context=C477fe33ADvjVQa1PpcFMHQhUpWXpGognQqdueCmQ1nu8mHKLSzeI=. The video shows concentration through sluicing over a carpet then panning using soap as a surfactant and finally concentration using borax. Do you think that this method might be more widely applicable or is the Blacksmith Institute falling into the trap you describe? Yes the Blacksmith Institute is falling into this trap and knowingly causing others to do the same. They are one of the main groups overselling it and giving the impression that there is a miracle cure. They are misleading the world by claiming that borax is a direct replacement for mercury. This is simply not true. Hi...I have gold and iron clumped together. From smelting of ore. Can I use borax in another smelt and pour to get more of the iron out? You have raised a valuable point here that the articles published on the Borax method don't mention "how" they managed to concentrate the gold. One article of trials performed in Tanzanian villages mentioned that they reached concentrations of 90% gold before smelting the gold with borax, but there is no mentioned of the concentrating methods. Is there maybe a point here that this works of nugget gold and gold dust that can be panned and does not need to be crushed out? Presumably this does work, but in very particular circumstances only? Maybe rather than writing off the entire process as a lie, you could elucidate on the cirmcumstances where this does work? I agree that Borax is not a replacement for mercury. It is used in a totally separate stage of processing. Mercury does have its benefits and its drawbacks, but it is a useful tool as long as it is thoroughly understood and safely used. My advice is to research, read and understand mercury as well as all mining and processing methods and choose the best option for your mining needs. 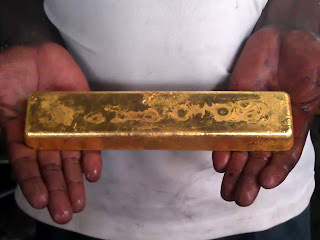 I have been an artisanal gold miner for almost 25 years. Until I saw a report on the news tonight about artisanal gold miners in Indonesia and the Philippines, I had never before heard of borax replacing mercury in concentrating gold. It sounded intriguing so I did some research and...here I am at this blog! I am not surprised that it is not true that borax can replace mercury in concentrating gold. The report (PBS Newshour, 2/17/15) really was about the mercury that they are using which is poisoning these people and their environment. In my humble opinion the vast majority of the mercury pollution is caused by the fact that they are using heat to burn the mercury off of the gold, which vaporizes the mercury putting it directly into the atmosphere to be breathed in by the miners and anyone else downwind. I have been using mercury to concentrate gold for much of my mining life. Using mercury safely does require respect, knowledge, and safety. Mercury should be treated as a valuable resource and conserved, not just burned off into the atmosphere never to be used by you again. I accomplish this by "burning" it off with nitric acid - which puts the mercury into solution - rinse the solution off of the gold, then recover the mercury to be used by me again later. By using this method I have never had to buy mercury! Caution: mercury is dangerous. Do not attempt to use it unless you know what you are doing and you have the proper safe equipment.